Baron Samedi by Yggdrasil Gaming is a 5 reel and 25 payline slot, available at Easy. It's got a voodoo theme and is playable on all your devices from as little as 25p to £125 per spin. The main focus of the slot is the 36 tarot cards that reward 10x multipliers, super-stacked symbols, mystery symbols, wilds, 5 of a kind payouts, random wild symbols, extra free spins and more. Yggdrasil Gaming is a software company headquartered in Malta. The company was formed in early 2013 by Fredrik Elmqvist, a former CEO at NetEnt. The man's vision was to develop technologically advanced gameplay, not just number based games. The intricate and unusual name was picked from Scandinavian Mythology, with Yggdrasil referring to a huge ash tree, that serves as a home to eagles and dragons. Yggdrasil is also referred to as the door leading to all the 9 mythical worlds, inclusive of Asgard, the home of the gods. In Baron Samedi, you will get to join the all-mighty spirit lord of the dead on a journey to the magical voodoo world where we hope the mischievous baron will help you gain great riches, as well as gaining lots of slot promotions. Symbols surrounding the reel set include; candles, a bird’s skull, dice, beads, a lit cigar and a potion pot. Symbols on the reels are 4 gemstones, Brijit (a voodoo woman), Baron Samedi and voodoo dolls. Baron Samedi pays the highest value of 4.8x your bet when you land 5 on a line. A goat skull is also on display and acts as the wild symbol. It can substitute all other regular symbols. 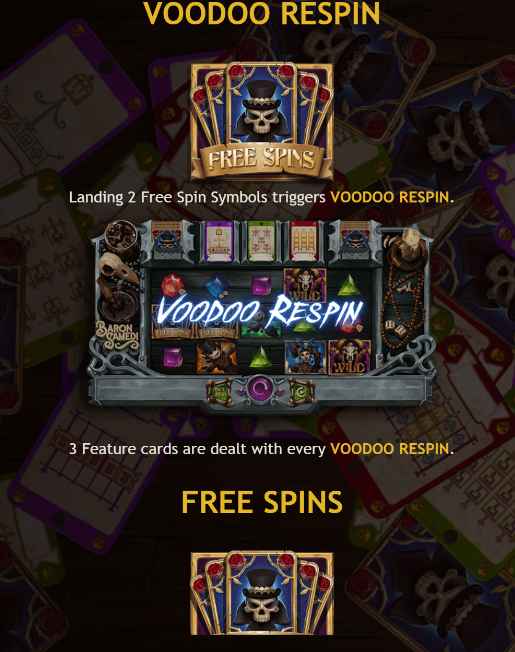 Voodoo Respin feature -This feature is activated when you land 2 free spins symbols. 3 cards are dealt and end up giving several extras such as mystery symbols, multipliers, super-stacked symbols, wilds, mystery reels, random wild symbols, transforming symbols, 5 of a kind wins and fully wild reels. Free Spins feature -This feature is activated when 3, 4 or 5 free spins symbols land on the reels. They will award 7, 12 or 15 free spins with 2x, 15x or 1,000x your bet respectively. Players can also get 3 cards dealt after a free spin. With up to 36 collectable features, you can complete the card collections to win 3 extra free spins with the collected card locking in position and awarding a particular feature for the duration of the feature. There are loads of features you can win from which means the free spins round is packed with opportunities. You could win the 10x multiplier, wild reels and see symbols transforming into wild symbols. With up to 9 collections to complete, you can find yourself winning up to 27 extra free spins which means 42 free spins in total. 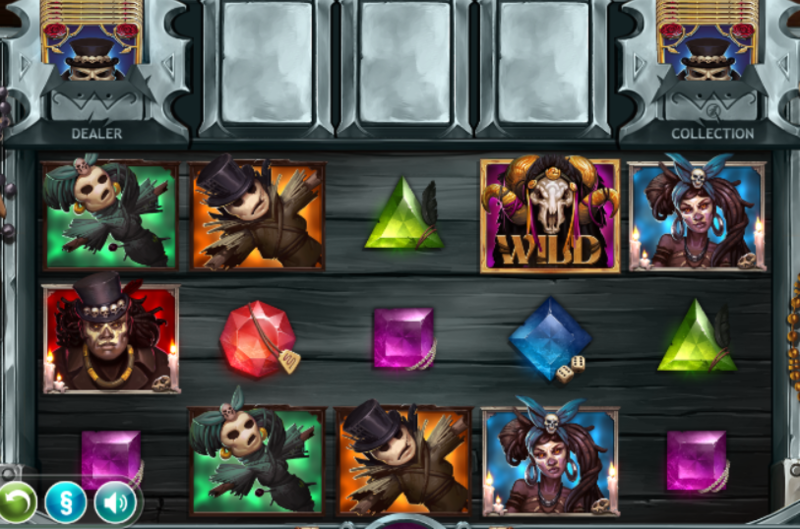 Baron Samedi has a superb design and is a unique slot in terms of how tarots influence the free spins with lots of paying extras. The key to landing that big win is getting 5 scatter symbols (to reward 1,000x your bet) but during the free spins, wins can go up to 1,200x your bet on each free spin. That's if you can fill the reels with the highest value Baron Samedi and win a 10x multiplier. Overall, this is a brilliant and well thought out slot. You can play casino slots games like this here at Easy Slots.